Hello, it's me. Hello, can you hear me? Hello from the other side. I must of thought of posting a thousand times. If you don't get that reference above well then we simply can't be friends anymore. As far as for the rest of you, hi, pals! I'm back! Hard to believe it's been quite a few weeks since my last post but man has this month been rough. We just got back from the Virgin Islands where I was forced to sleep in, spend long hours in the sun with a cocktail in hand, and swim in the crystal blue ocean. PURE TORTURE, I tell you. But enough about that, let's talk about this simple Thanksgiving project Little B and I created a few weeks ago. I have a stash of white glassine bags hiding out in my craft room collecting dust and I thought it would be fun to create some cute Thanksgiving goodie bags; you know something to keep the kids entertained while they're waiting for dinner or to keep them out of our hair while the adults are STILL trying to enjoy their meal (we have a 2, 3, and 6 year old at our holiday gatherings). I call these "Fowl Play" goodie bags. Haha, get it? Oh, I crack myself up. I know the word "blissful" isn't exactly what comes to mind when attempting to craft with a two year old, which is why I try to keep our collaborative projects quick and simple. These goodies bags met both of those goals. At this age, I find it's best to just let tots go to town when it comes to painting. Thankfully, the watercolor trend is still going strong these days because that's exactly what Little B's "artwork" reminded me of. 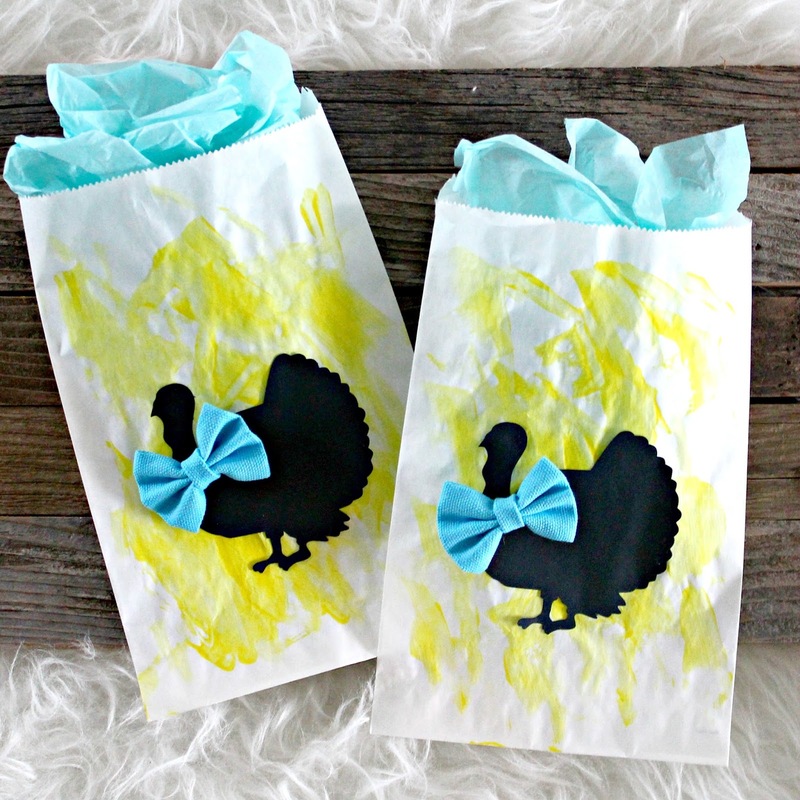 Then I finished up the bags with the turkeys that I cut out using my Silhouette Machine. The bows were left over from my no-sew bunny ear gift bags. Love to see more holiday kid's crafts?! There are 6 weekly challenges (we're just now on week 3) for you to share your fun DIY holiday creations. Every Tuesday, myself along with my creative co-hostesses announce a new theme. You can check out all of the rules by clicking on the "Create 4 The Holidays" wreath logo pic in my IG feed. Don't want to participate but just want to be inspired by everyone's creativeness? Search hashtag #create4theholidays and sit back and check out everyone's crafts! Last week was DIY Childrens Crafts and here were a few of my favorite projects that were shared! Hope everyone has a delight Thanksgiving! Gobble, gobble.